Just arrived! Handle feels nice in my hands and the blade feels very balanced. Apocalyps, Spider Monkey, Leonardo63 and 4 others like this. @dogboye and @bikerector Do you think the nano grip would benefit from having liners installed? I haven't received mine yet. I think it would. My gut reaction says it feels better than the standard grips, but they could use a tiny bit more girth. Anybody have the nuke and non-nuke comp finish to compare weight difference as related to feel in hand? I do, especially if you have bigger hands and want to use it aggressively. It's very comfortable for "regular task" but if you start swinging it around, it may have a tendency to slide forward. I found the pinky hook (talon?) really got my pinky good after a few swings. I'm tempted to put a lanyard on it and then hang way off the back so I only have a pinch grip on the tail end and the pinky and ring fingers are off the handle altogether. I did this with my ratweiler and it made it a mean chopper for the size. Speaking of lanyard, who is the top lanyard maker on this forum? I would like to add one to my new Rambo Knife. 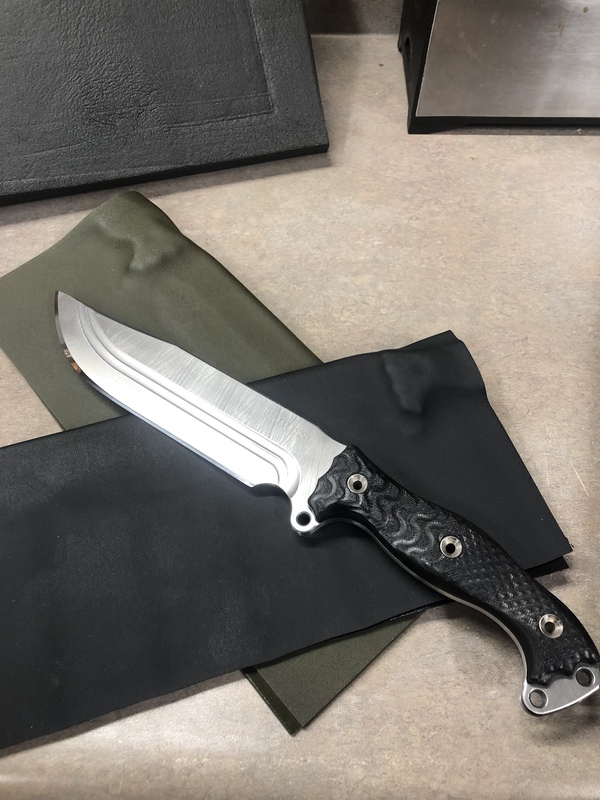 Such as David Brown is to top of the line kydex sheath maker for Busse knives, who is for Lanyards? Note: I don't want traditional Lanyards. I want something unique and pop out Rambo-Steampunk-quirky-Fallout 4 style. @u812...Jeff he is active here in the Busse Forums he might have something you can use. Maybe. My only hesitation is I wonder if that would make it feel wider than deep. Make indexing more difficult. Don't know. The thing about the fusion handle is it is tall enough that there is no doubt or the orientation of the edge, if you get my meaning. You just know where it is. This seems to me to be right on the edge of that, except the contouring of the grip panels really helps, particularly at their narrowest. I just don't know, hard to say. That is what I'm most worried about if this gets into hard usage (haven't had a chance yet; east coast rain... and long hours at work). The chopping comfort of the fusion handle is the best thing about it, IMO. If the nano fusion detracts from that, I think it is a step in the wrong direction. Time will tell. I still say it will be GREAT on the NFNO. And maybe even further small blades (6-7 inch range). LOOOOOVE this handle. I can see why you guys with bigger hands like the larger fusion handles. I've never understood why before since they NEVER fit my hand, but the NANO is perfect for me. I also thought the blade on this was identical to the Forsaken Gemini, but it's a tad wider. Won't fit in my FG sheath. Cool little knife. Curious to see how it performs compared to my ASH2. Apocalyps, Leonardo63, mpjustin and 4 others like this. Yeah, it’s a little more Bowie blade than the Gemini. I really like it. And overall like the entire knife. I don’t DISlike the NF handle. It just isn’t blowing my socks off. Here is a pic of mine. Got the sheath molded. A black and a OD,not sure what color I will like til I get them done. Apocalyps, azwelke, Leonardo63 and 6 others like this. I think the handle will be great on smaller knives. I could see this being super on a knife similar to a ratmandu. Absent hard chopping tasks, I think the handle is great. The more I think about it, the more I really want a lanyard on it if I'm going to keep using it for chopping. It does the "bushcrafty" tasks so well that that it seems like another good "back-up to everything" knife, like the ratweiler, if I can get the chopping piece figured out, for my hands. I had similar troubles with my BK4 and eventually landed on bicycle inner tube taped onto the handle's spine. I think I'm going to try something more elegant with this one using some double-sided tape. Jeff, that edge looks awesome! Thanks,it was a tough one. Had a fairly rough edge on it. Would have been easier if I had found the factory edge and just polished it out. I think the 22 degrees I went with was a degree or two lower. Made for a scary sharp edge. The edge looks amazing! What did you use to put that nice edge on it? Got mine last night, although it is the wrong handle color , tan canvas instead of black canvas. It is, by far, the nicest version of comp finish I have ever seen. It looks like a subtle BIG finish... beautiful blade. I may not go through the hassle of sending it back. The handle wasn't too bad but I find my best grip is tight against the back end of the handle which, although differing from some of the other posts about the handle, seemed like it would do good for chopping for the way it fit my hand. Choked up to the front wasn't the best fit for me. The larger fusions seem to sit real nice choked up with my finger in the choil as well as the standard grip. It is interesting how these fit different people in different ways. You just never know until you get it. Keep or sell... decisions, decisions. Edit: Oh yeah it came pretty sharp also. Yeah, mine came sharper than another other Busse I've received direct from the shop. I was happy to see that. I got a ship-ding for Comp Finish and Combat Grade...2 different shipment notices?!? Should be here by the 15th, maybe before - UPS has been delivering the day before it is due here lately...of course that won't happen for the Busse packages though! Really interested to see how these feel.